Look My Way have a new t-shirt in their webstore. 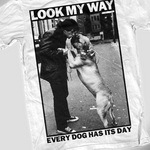 Every Dog Has Its Day tee is available in sizes from x-small to 3xl. Grab it here! And while you there, cop the 520 ep!